Chris Somerville visits Vanier on April 11th as part of Rick Hansen’s Ambassador’s program. His message was one of Accessibility and Inclusion. Draft copies posted by Mrs. Wiebe’s students. Student are encouraged to re-work their writing to continually improve quality through the use of feedback. Student watch a video about Rick Hansen’s Man in Motion tour during Chris Somerville’s presentation. A real estate agent from the Redwoods Development next door popped in to say hello and guess what…it was Mr. Vendramin’s former student, Nav Kandola, from way back in 1994! Is Mr. Vendramin REALLY that old???? Photo day is coming April 16th. 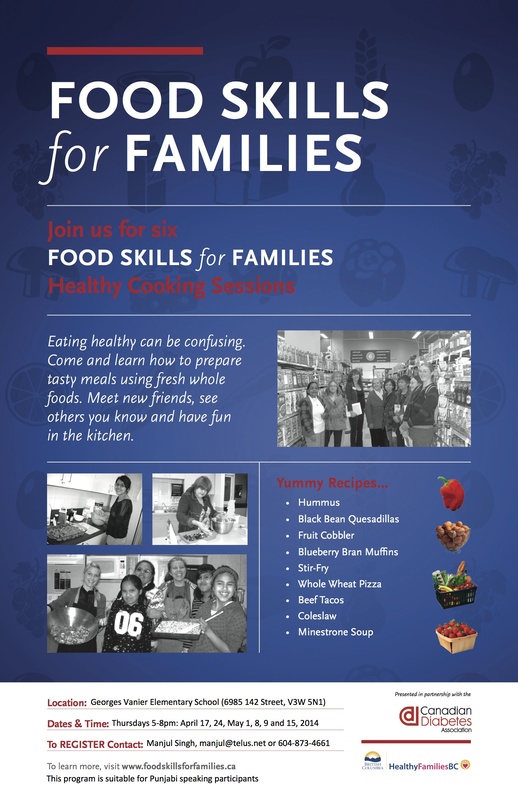 FOOD SKILLS FOR FAMILIES – Register NOW! VIDEO of the WEEK: What Will Be YOUR Legacy? It is with very mixed emotions that I share with you that I have been appointed the new Principal of Cambridge Elementary at the conclusion of this school year. While I have always preached that “change is good”, it doesn’t mean that change is easy. In this case, change is most definitely not easy. I have grown to love our community very much! From absolutely wonderful students, to welcoming and generous parents, to hard-working and skilled staff. Together, we have built something very special here and from a distance, I look forward to continuing to hear about the great things happening at Georges Vanier Elementary. I have felt welcomed from my very first day back in 2009. For this, I say thank you! Like our whole staff, I will continue to work hard and dedicate myself completely to this community I care so much about. I will always cherish my time at Georges Vanier and look forward to creating more memories in our last few months together. I would also like to introduce you to Mr. David Dekerf, your new Principal as of July 1. Mr. Dekerf is currently the Principal of T.E. Scott and comes with a great deal of experience and expertise. I have known Mr. Dekerf for several years and know he will do a wonderful job as your new Principal. He looks forward to introducing himself through the VanierNews and in person. Stay tuned! We are excited to announce that very soon, both students and parents will have access to FreshGrade portfolios. You will recall from earlier editions of the VanierNews, teachers have been using an online product called FreshGrade to both collect and assess learning evidence. The true power of this tool is its ability to not only collect evidence, but to share it with students and parents. Shortly, students and parents will be able to view portfolio items and comment on these items. Student learning benefits most not by evaluating with percents or grades, but rather when students receive DESCRIPTIVE FEEDBACK they can apply to their own learning. Student learning is also enhanced when students themselves are given the opportunity to assess their own learning. We believe the the consistent use of these new FreshGrade features will improve student learning, independence, and self-awareness. We were also thrilled to see that Mrs. Wendy Hall, a grade 2 teacher at our school and avid user of FreshGrade, was featured this week on FreshGrade’s blog. Well done, Mrs. Hall. Unfortunately, LICE is nothing new to our school, or any school for that matter. Parents and the school need to work together when cases of head lice are identified and schools are to follow District Policy. This includes informing the parents of the identified student(s), as well as the parents of all students in the class that a case of head lice has been identified. In all instances, student privacy is maintained. You can find treatment options HERE: Head Lice Treatment. Most importantly, as this video shares, it’s not the end of the world if your child has lice and our school is here to help! April 17 Movie Night – Doors open at 6:00 p.m.
Legacies transcend the boundaries of time. 15 – Ready, Set, Learn Event: StrongStart – 8:30 – 10:00 a.m.
24 – Intermediate Speechfest – 1:00 p.m.
30 – Assembly – 1:45 p.m.
1 – Talent Show – 12:45 p.m. This entry was posted in Vanier News and tagged @DavidDekerf, @georgesvanier36, anna crosland, assessment, chris somerville, communicating student learning, community schools partnership, crosland_a, CSP, David Dekerf, food skills, food skills for families, Frank Hurt, Frank Hurt Secondary, freshgrade, georges vanier, georges vanier elementary, georgesvanier, head lice, home school communication, learning, learning commons, leave your legacy, leaving your legacy, legacy, lice, man in motion, PAC, parenting, parenting corner, parents, rick hansen, surrey, surrey schools, surreyschools, teaching, vanier, vanier news, vaniernews. Bookmark the permalink.